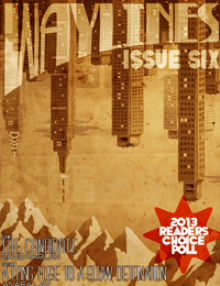 Waylines is a magazine of science-fiction, fantasy, horror and anything between. Our goal is to capture the "bang" in speculative fiction - that old-fashioned, mindbending, wow factor. As such, we aren't limiting ourselves to a specific style of story or even media format. We publish fiction, poetry and stream speculative films. Prepare to be blown away. FFantasy Fantasy Open to all/most Subgenres, including: Cross-Genre. HHorror Horror Open to all/most Subgenres, including: Cross-Genre. SScience Fiction Science Fiction Open to all/most Subgenres, including: Cross-Genre.